Reprinted with the Kind Permission of Antiques Trader (Australia), May/June 2008. During the twelfth century, when Crusaders recaptured many Christian relics from Constantinople, Jerusalem, and Antioch, commerce in these items reached a peak throughout Europe and the Holy Land. A Medieval city that owned a relic had a good chance of becoming a centre for pilgrimages and therefore the recipient of substantial revenues. Trafficking in fake relics resulted and became a profitable enterprise. In his Pardoner’s Tale, Chaucer lampooned a clergyman who passed off sheep bones and a mitten as relics (‘You’ll have me kissing your old breeches too and swear they were the relic of a saint…’). Today, relics are sold in amazing numbers via Internet auctions, many of which close with bids in the hundreds and thousands of dollars. Religious relics are items that are connected in some physical way to Jesus Christ, a canonized saint, or a person who has been beatified. There are three classes of relics: first class (most often tiny bone fragments from the saintscalled ex ossibus), second class (including clothing that came into contact with a saint while the saint was alive), and third class (usually a piece of cloth that has been touched to a first or second class relic). The term relic derives from the Latin reliquiae (remains) and relinquere (to leave behind). While the Roman Catholic, Orthodox, and sometimes Anglican/Episcopalian practice of preserving and venerating relics may seem odd and even gruesome to some, these sacred items have been an important part of both liturgical and ritual tradition for many centuries, and Old Testament references support the ancient custom (Exodus 13:19 and 2 Kings 13:21). Religious relics are often preserved in small containers called thecas. Typically, a theca is round or oval and made of metal with a glass crystal in the cover that allows the relic to be seen. The relic is placed inside the theca, along with a handwritten label bearing the saint’s name, and fastened at the back with threads and a red wax seal that bears the insignia of the issuing religious authority. An official Church document, called the authentic, accompanies every first class relic. Usually written in Latin, an authentic describes the theca and the relic, and verifies that the relic is from the saint whose name appears on the label. Often a theca is encased in a reliquary – a coffer or shrine designed for display. Reliquaries can be highly ornamental works of art crafted from various metals and inlaid with precious and semi-precious stones.During the Roman persecution of Christians, the remains of thousands of Christians were taken to subterranean burial chambers in Rome known as the Catacombs, where veneration of Christian martyrs’ bones very likely began. While the official Roman Catholic teaching on relics dates to the Council of Trent (1566), the earliest written reference to the preservation and veneration of a saint’s bones is recorded in The Martyrdom of St. Polycarp (c. 155-157 AD). Relics relating to the Christ’s passion and death were first made public in the mid-third century through the efforts of Helena, mother of Constantine the Great. Despite her advanced age, St. Helena is believed to have travelled to the Holy Land where she discovered numerous items, including the cross on which Christ was crucified. St. Cyril of Jerusalem has written that fragments of the cross that was found by St. Helena were distributed worldwide. Alleged splinters of the True Cross are seen in today’s marketplace but few are properly documented, and detractors support the claim that if all the pieces of supposed cross relics were glued together they would comprise a cross of enormous proportions. Religious interest aside, reliquaries are often collected for their age and artistry, and some are spectacular works of art. Relics, however, are nearly always collected for their spiritual meaning. 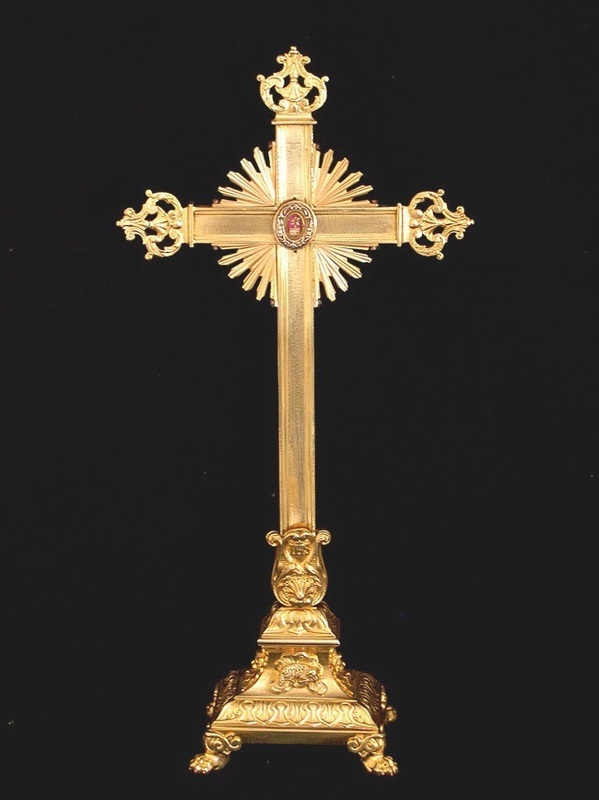 Because the Roman Catholic Church does not approve or authorize relic sales and does not issue relics to individuals (only to churches and ecclesiastical groups for public veneration), relics from the estate collections of private individuals are often sold to dealers who then re-sell them for substantial monetary gain. Some vendors get around the Church ruling against relic sales by claiming that only a theca or reliquary is for sale and that the relic it contains is a gift. Theft is a significant concern. In 1981, thieves stole St. Lucy’s remains from a Venetian church and, in 1991 four masked thieves entered St. Anthony’s Basilica in Padua, Italy, threatened worshippers at gunpoint, and stole St. Anthony’s relics. While these major relics were recovered, less dramatic thefts from churches, monasteries, and convents are ongoing, and stolen articles enter the marketplace with relative ease. Theft notwithstanding, another problem inherent in relic sales is dishonesty (deliberate and through ignorance). Fake relics and forged documents are often purchased at great cost to the trusting and to the gullible – a concern that is as imperative today as it was in the twelfth century.